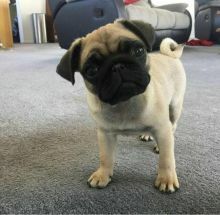 We have two amazing Pug puppies, a male and female. They currently are 11 weeks.These pups have had their first round of vaccines and are current on deworming schedule. Both Mom and Dad are CKC registered but I am giving pups as pets. 🐾💝🐾 Email at [ fabianrecaldo@gmail.com] Text at : 678-871-7681for more information.Email at [ fabianrecaldo@gmail.com] Text at : 678-871-7681for more information.